Kevin Hillstrom: MineThatData: But E-Commerce Is Growing, Mobile Is Not Crushing E-Commerce!!! 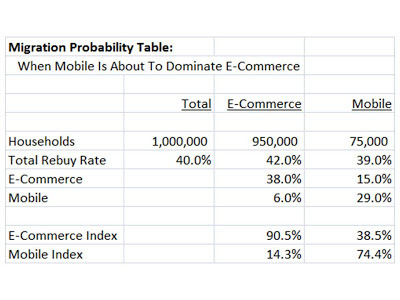 But E-Commerce Is Growing, Mobile Is Not Crushing E-Commerce!!! Almost all of our analytics are campaign-based, point-in-time efforts that horribly mislead us. E-commerce grew by 15% last year, to $50,000,000. Mobile, however, is tiny ... it grew by 700%, but is only $3,000,000. Mobile is nothing. E-commerce is where it is at. Might be right, might be wrong. But this is not how we should look at the issue, is it? Our old friend, the Migration Probability Table (remember that ... think 2006 - 2007), that old thing tells us the real story. If your table looks like this, e-commerce is finished. No, not finished in 2013, but in the long-term, it's toast. 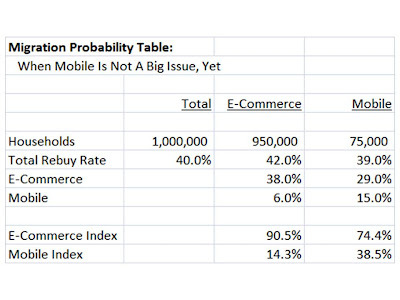 This table shows us that customers are leaking out of e-commerce into mobile, but the mobile customer is more likely to stay within mobile than within e-commerce. This, by the way, is exactly what the catalog-to-ecommerce table looked like ten years ago. Catalog was finished. No, not dead, but catalog was destined to become the niche-favorite of Judy's generation. Jennifer was leaking out of catalog into e-commerce. She never looked back. Amazon and Google thank her for her patronage. There are two things that could be happening in this instance. Your mobile experience stinks, so customers don't go back to it. Your customer is older, and doesn't want to stay with mobile, she'd prefer to stay with the channel she is comfortable in. This is the way tables looked like for catalogers with 55+ year old customer bases, back in the day (i.e. 2003). Older customers tried e-commerce, didn't like it, and instead shopped catalogs via the telephone. This happened all the time, and led catalogers to believe they were "right". And in the short-term, they were 100% right, absolutely. Today, of course, those same catalogers have a 65 year old customer base that never embraced e-commerce, and they have a 5-10 year window before the whole thing comes crumbling down. Pundits are going to dip your impressionable frame into a warm bath of mobile body wash. They're going to tell you what "the customer" is doing, and they're going to scare the living daylights out of you. 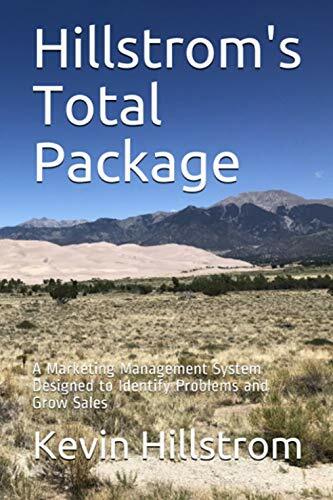 They do this to generate page views, Twitter followers, and to enhance their own thought leadership position in the industry. Don't listen to the lizard logic they spew at you. Do the analysis yourself (or hire me, click here now). You will see, immediately, what your future holds. 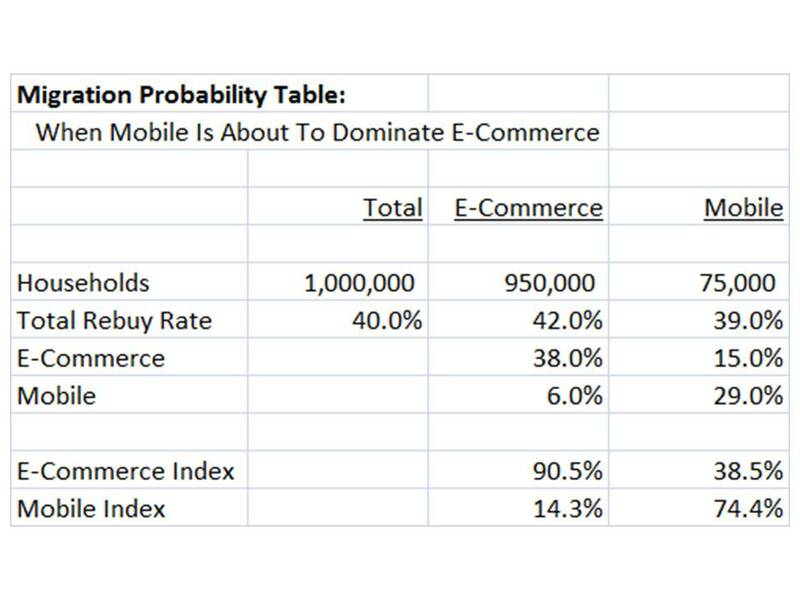 If mobile is going to crush e-commerce, your table will look like the first table in this blog post. 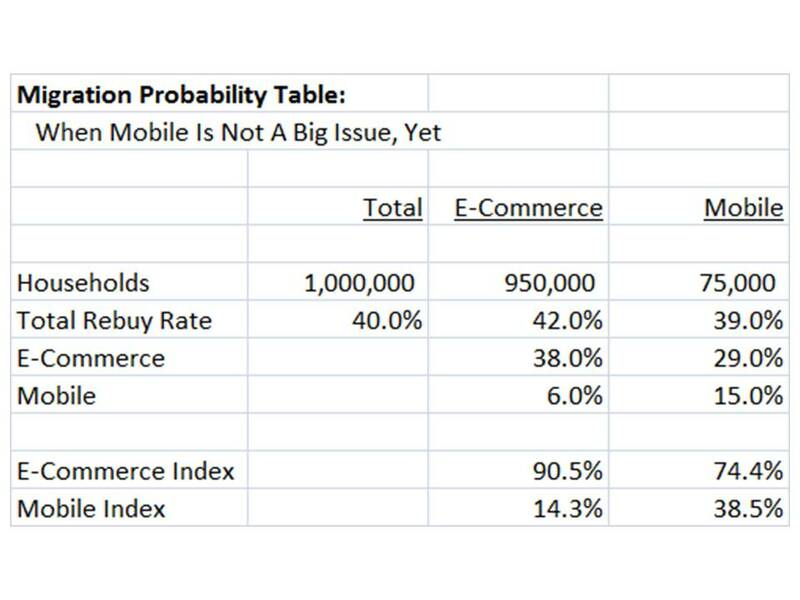 If mobile is not going to be something that crushes e-commerce, your table will look like the second table in this blog post. Either way, you'll know the truth, while others speculate. No, not dead, but catalog was destined δημιουργία e-shop to become the niche-favorite of Judy's generation. Jennifer was leaking out of catalog into e-commerce. She never looked back.